The LPN Series Line Strainer promotes a compact design with multiple configurations to fit the exact end use application. The LPN Series Line Strainer is rated to 150 psi at 70°F and 100 psi at 125°F. 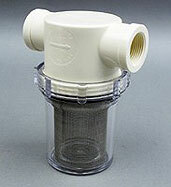 The Standard LPN Strainer has a Buna-N seal and Clear Nylon Bowl. Ethylene Propylene and Viton® seals are available. Screens can be cleaned without removing the strainer from the line. All component parts are available as replacement parts. The B Series Line Strainer promotes a compact design with multiple configurations to fit the exact end use application. The B Series Line Strainer is rated to 150 psi at 70°F and 100 psi at 125°F. 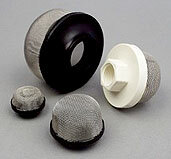 The Standard B Strainer has a Buna-N seal and White Nylon Bowl. Ethylene Propylene and Viton® seals are available. Screens can be cleaned without removing the strainer from the line. All component parts are available as replacement parts. The C Series Line Strainer promotes a compact design with multiple configurations to fit the exact end use application. The C Series Line Strainer is rated to 150 psi at 70°F and 100 psi at 125°F. The Standard B Strainer has a Buna-N seal and White Nylon Bowl. Ethylene Propylene and Viton® seals are available. Screens can be cleaned without removing the strainer from the line. All component parts are available as replacement parts. The Suction Series Strainer promotes a compact design with multiple configurations to fit the exact end use application. The Standard Suction Strainer has a molded PVC Body and 304 Stainless Screen. A White Nylon Body with 304 Stainless Screen is available. PVC Suction Strainers have a Female Friction Fit and are called out according to the size of the Male NPT mating part that goes into the strainer. Nylon Suction Strainers have a True Threaded Female NPT connection. The 685 Series Flow Control Valve incorporates a 1/2" Female NPT Polypropylene Body and Flow Control insert that operates as a flexible orifice to provide reliable flow regulation from .13 to 3.96 Gallons Per Minute. Maximum inlet pressure is 125 psi. All materials are NSF Approved under Standard 61. The 687 Series Flow Control Valve incorporates a 3/4" Female NPT Polypropylene Body and Flow Control that operates as a flexible orifice to provide reliable flow regulation from .13 to 3.96 Gallons Per Minute. Maximum inlet pressure is 125 psi. All materials are NSF Approved under Standard 61. The 693 Series Flow Control Valve incorporates a 3/8" Female NPT Polypropylene Body and Flow Control that operates as a flexible orifice to provide reliable flow regulation from .13 to 3.96 Gallons Per Minute. Maximum inlet pressure is 125 psi. All materials are NSF Approved under Standard 61. The 694 Series Flow Control Valve incorporates a 1/4" Female NPT Polypropylene Body and Flow Control that operates as a flexible orifice to provide reliable flow regulation from .13 to 3.96 Gallons Per Minute. Maximum inlet pressure is 125 psi. All materials are NSF Approved under Standard 61.